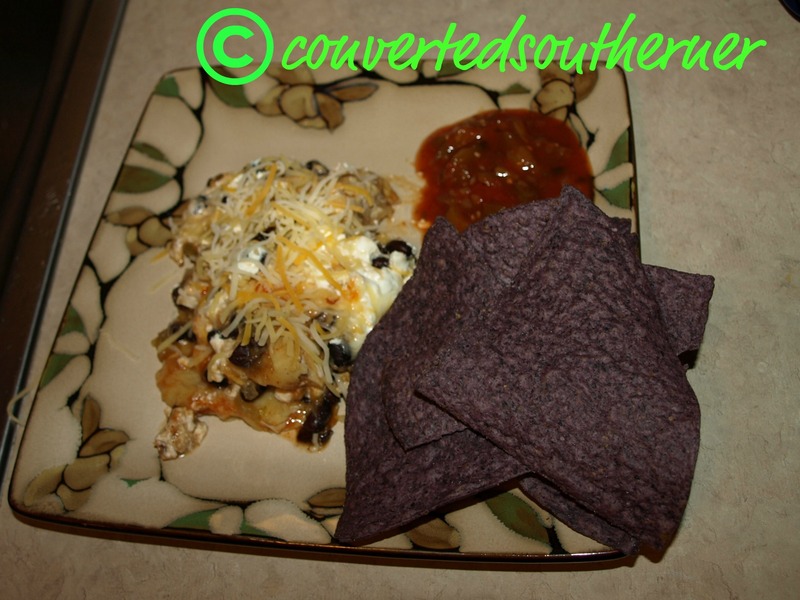 I made a really yummy Mexican casserole the other night… my first ever attempt at a casserole with a Mexican taste. It was sooooo very good and I got a ton of meals out of it for the next few days. I got it off of the Sweet Treats & More blog, but made a few additions and subtractions for my version. 2) Mix the cumin, coriander and garlic powder together in a small bowl…. toss chicken in to the mix. 3) Spray some vegetable spray in a frying pan and sauté the seasoned chicken, sprinkle chili powder over chicken. Cook thoroughly. 4) Drain and rinse the black beans, transfer to a medium bowl. Drain green chilies and add to the bowl. Mix with beans. Add a light sprinkling of taco seasoning, mix well. 5) Add cooked chicken and mix thoroughly. 6) Spray a baking dish with vegetable spray and cover the bottom with enchilada sauce. Pending the size of the dish determines if you use half or a 1/3. The bottom of the pan should be covered. 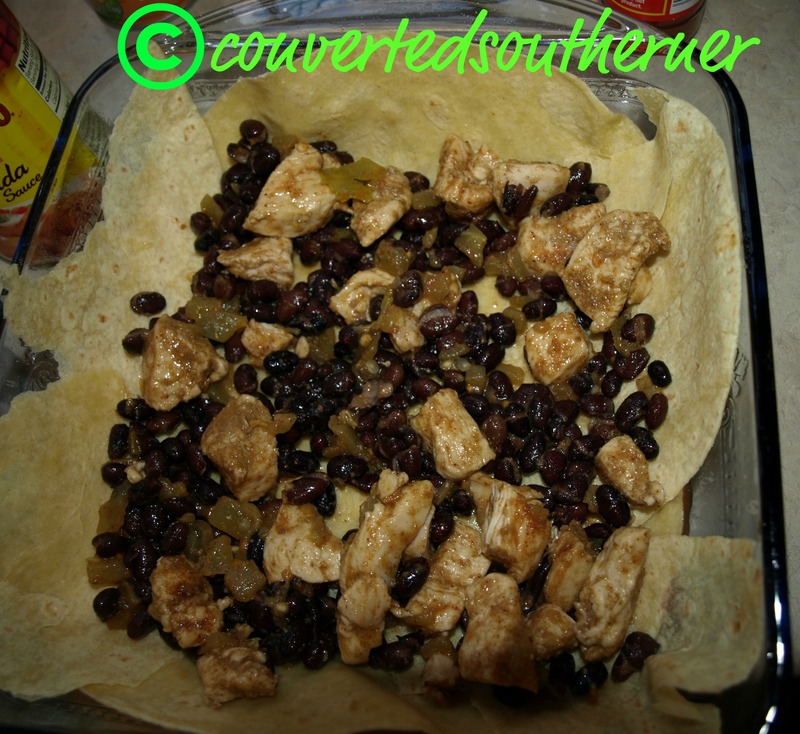 7) Lay two-four tortillas across the pan, overlapping if needed, so that the dish is covered. 9) Spread cream cheese and shredded cheese over chicken and beans. 10) Repeat the process starting with the enchilada sauce, make as many layers as your ingredients will allow, I get about two. 12) Cover with aluminum foil and bake for 30-35 minutes. Remove foil and cook for an additional five to ten minutes. 13) Let dish stand for ten minutes before serving. I served with organic blue corn tortilla chips and salsa, with a small salad. Oh, and a dollop of sour cream on top of the casserole and fresh bit of shredded cheese. So yummy, and I really did get a lot of meals out of it! ← Still Talking About San Antonio!